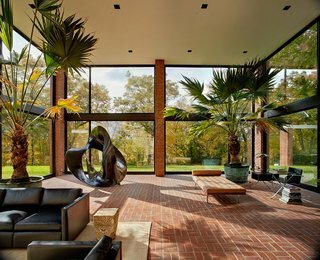 It's safe to say that Philip Johnson was one of the most famous and influential American architects of the 20th century. 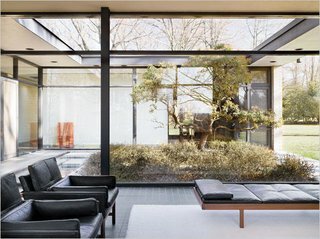 A pioneer of American modernism, Johnson designed the iconic Glass House for himself in 1949—creating a distinctive glass facade that was inspired by Mies van der Rohe's Farnsworth House. 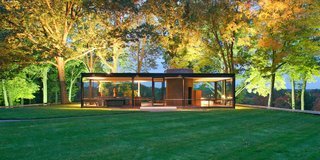 Although the Glass House is undeniably his most famous residential property, a look through these other significant residential projects might leave you struggling to choose a favorite. 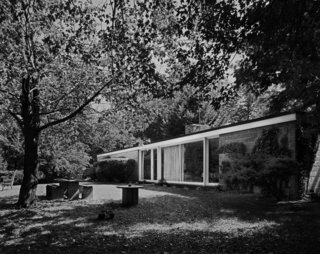 The house that started it all: Philip Johnson's Glass House in New Canaan, Connecticut. He and David Whitney used to invite great minds from the architecture, design, and art worlds to visit the house for evenings of discussion and debate. When the Glass House opened to the public in 2007, its programmers continued the invite-only tradition. Built in 1953, the Wiley House is made up of a single glass-and-wood rectangular pavilion that’s perched on top of a rectangular box made of stone and concrete. Johnson chose the six-acre plot of land himself and was particularly fond of the natural slopes of the site, which is surrounded by hickory trees. 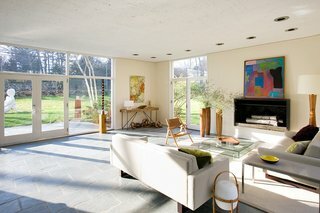 Completed in 1946, the Booth House was originally built for an advertising executive and his wife before becoming a rental property in 1955 for the architectural photographer Robert Damora, and architect Sirkka Damora. The Damoras later purchased the home and have lived there ever since. Now 93 years old, Sirkka has been seeking a new owner for this piece of architectural history. Litigation over the title means that the Booth House could face being torn down—so its buyer will also be its rescuer. Located across the street from Johnson's own Glass House, the Hodgson House was built for Richard and Geraldine Hodgson in 1951. The U-shape International Style home features a garden court. The understated facade of the Alice Ball House conceals 12-foot ceilings. 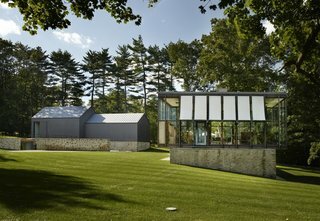 It's one of five significant houses designed by Philip Johnson in New Canaan, Connecticut. 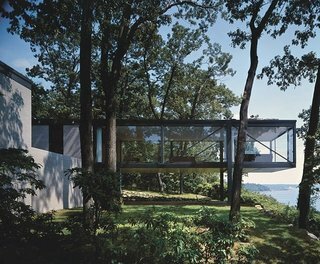 Designed by Philip Johnson for Eric Boissonnas and his family, this house was completed in 1956. Originally designed as a series of pavilions constructed of steel, brick, and glass, the home has since been updated by subsequent owners. This modernist home in Lloyd Harbor, Long Island, was built in 1956.